Desert Sun Mining & Gems offers introductory answers to frequently asked questions about Oregon Sunstone. Click on a subject heading below to view questions and answers relating to your selection. Links throughout the answers will guide you to further information on our website or from other sources. Should you have any further questions, please consult our Contact Us page. Oregon sunstone is a feldspar of the Labradorite family. It is found in four places in the world, but only in Oregon is it of gem quality. What Makes Oregon Sunstone Unique? Oregon sunstone is the only sunstone in the world that contains pure copper platelets which are called "Schiller." Schiller imparts a warm, rich quality to the gemstone and makes the stone appear to glow with its own internal light source. Oregon sunstones retain this glow when viewed from a great distance or even by starlight. What Colors Does Oregon Sunstone Come In? The Ponderosa Mine produces the widest range of colors in Oregon sunstone ever discovered. The material that has Schiller includes clear, yellow, light pink, salmon, orange, green, intense red, and blue-green. The facet grade material comes in all colors of the rainbow, although shades of red and green are the most rare. At its best, the red facet grade material from the Ponderosa Mine is as fine as the finest ruby or red spinel from Burma, blue-greens are like emeralds, gray-greens like green diamonds, peaches and orange can double for imperial topaz, and bi and tri-colors resemble the finest tourmalines available. Is the color in Oregon sunstones natural? Yes. Oregon sunstone from the Ponderosa Mine is an all-natural gemstone. Desert Sun Mining & Gems does not enhance its gemstones in any way with chemicals, irradiation, heat or oiling. 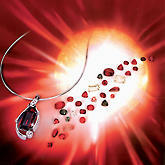 Though it is not widely known, sunstones are naturally found in more colors than most other gemstones. Created by nature - pure, radiant, and simply beautiful. Where do Oregon sunstones come from? The largest source of natural Oregon sunstones is the Ponderosa Mine, located in the high desert of eastern Oregon. The Ponderosa Mine produces the highest quality and greatest volume of Oregon sunstone available anywhere, though sunstones can also be found in Lake County at the base of the Hart Mountains. How do Oregon sunstones compare to other colored gemstones? At 6.5 to 7.2 on the Moh's hardness scale, Sunstone compares favorably with Tanzanite, Topaz, Amethyst, Emerald, and other well-known gemstones. What are the prices of Oregon sunstones? Prices can range from $20.00 per carat to as much as $2500.00 per carat, based on cut, clarity, and weight. Please contact your Oregon sunstone retailer for pricing details. What's the best way to wear Oregon sunstones? The colors of Oregon sunstones are very complimentary to both the coolness of platinum and the warmth of gold. Its characteristics allow the gem to be cut and polished in a variety of methods, all of which only enhance its natural splendor. Should Oregon sunstone jewelry be worn just for special occasions? Oregon sunstone is a gemstone for all-occasions. From casual outings with friends, to a formal black tie event, Oregon sunstones make a beautiful and stylish statement. What about men's jewelry with Oregon sunstone? Oregon sunstones are perfect for men's rings, cufflinks, tie tacks, and even lapel pins. Ask your local Sunstone retailer about the masculine settings they have available. The costs associated with tag heuer replica are often affordable simply because and that's the reason why just about everyone are able all of them. Whether you need a little or perhaps a big 1, these types of fake rolex tend to be certainly getting the option of everybody. Personally, i don't like to invest a large amount upon purchasing costly wrist watches when i 'm willing in order to preserving some cash following breitling replica uk my personal fundamental requirements. And so i 'm no top notch course individual who can't reside without having manufacturers. After i talk about cartier replica sale why is me personally really feel great is actually these wrist watches tend to be affordable and therefore are generally during my spending budget.